This set is comprised of the adidas Essential Multi Purpose Bench and the York 50kg Black cast iron barbell and dumbbell set. It's an original piece of gym equipment that helps you work your whole body and ensures comfortable usage thanks to the thick padded seat and back support. You can also adjust the back support through 3 levels of incline and flat to find the best training position for you. With the fly curl and the leg curl and thigh extension (both with weight plate holder) and a wide range of exercises including bench press, butterfly press, chest press, leg press, leg extension and back leg curl, you can concentrate on any part of your body whenever you want. Thanks to the durable metal frame construction, it’s stable and long-lasting. It includes 20 weight plates of varying weights and 2 dumbbell bars, a barbell bar and 6 spinlock collars which all come in a plastic carry case. It even comes with an exercise wallchart to help you get started. 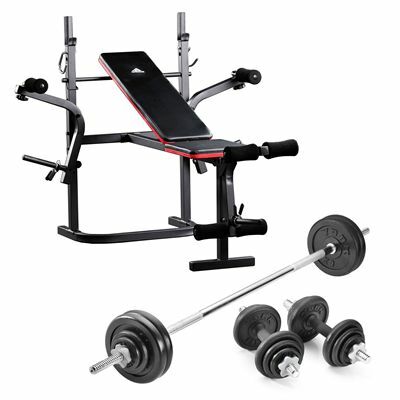 for submitting product review about adidas Essential Multi Purpose Bench with 50kg Cast Iron Weight Set.